The Solar Foundation has updated its map on the number of solar jobs in every state, metropolitan area, county, and congressional district, revealing how solar energy is supporting local economies nationwide. The interactive map includes previously unreleased data on solar jobs by metropolitan statistical area (MSA), county, and federal and state congressional district, along with detailed statistics on the solar workforce in each state. 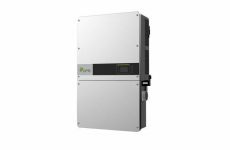 The Solar Foundation also released detailed fact sheets on all 50 states, the District of Columbia, and Puerto Rico. The interactive map can be viewed at SolarStates.org. The Solar Jobs report found there are 242,343 solar workers in the United States as of 2018. 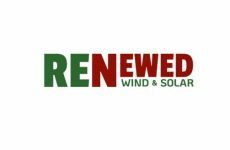 Nationwide, solar jobs declined 3.2 percent from 2017. At the same time, jobs increased in 29 states, including many states with emerging solar markets. “Despite the short-term jobs decline nationwide, it’s very encouraging that solar jobs increased in several major cities last year, and the continued expansion of the U.S. solar industry bodes well for job growth in the future,” said Andrea Luecke, President and Executive Director at The Solar Foundation. The metro area with the most solar jobs overall was San Francisco-Oakland-Fremont, California, with 22,101 solar workers. However, jobs in the region declined by 9.7 percent in 2018. The other top MSAs for the total number of solar jobs include Los Angeles, New York, San Diego and Boston. 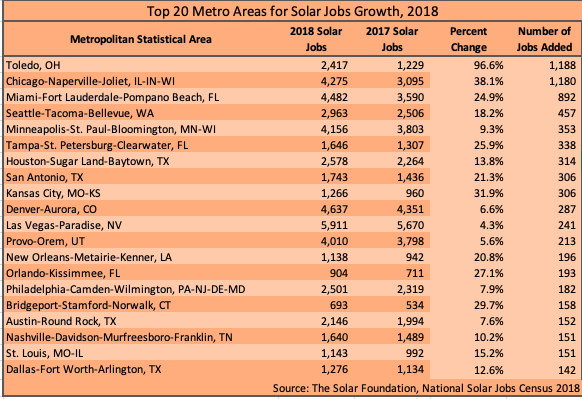 Some of the top metro areas for the number of solar jobs added in 2018 include Chicago, Miami, Seattle, and Minneapolis-Saint Paul, among others.